You can connect Vocus.io activity to any external application through webhooks. When combined with services like Zapier, users can design an endless range of workflows - such as post a message on a Slack channel, get a notification on your phone, or tag a lead in a CRM. A webhook (also known as a web callback) is a way for an app to provide other applications with real-time information. The caller (in this case Vocus.io) makes an HTTP call to the callee (such as Zapier/IFTTT or any other service). 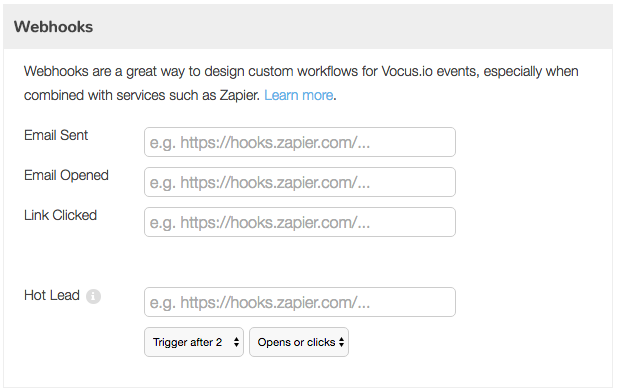 To trigger a Zapier workflow from a Vocus.io event, you'll need to tie one of Vocus.io webhooks to a Zapier endpoint. See this tutorial on Using Zapier for Hot Lead Notifications. The above triggers hold true for any email, including those from a mail merge campaign or an automated followup sequence. Each of those triggers will include the email subject line, the recipient email address, among other details. A Vocus.io webhook will include the following details in its body.